We recently spoke to Harris Georgiou, volunteer with the Hellenic Rescue Team of Attica (HRTA). Scent participated in SCI:COM, the largest science communication event in Ireland, on Thursday 7th December 2017. The First Italian Citizen Science Conference was held at the headquarters of the Italian National Research Council in Rome 23-25 November 2017. The 3rd Scent plenary meeting was hosted by Scent partner IHE Delft Institute for Water Education 7-9 November 2017 in Delft in the Netherlands. We recently spoke to Marian Mierla, Scientific Researcher at Danube Delta National Institute (DDNI). This article originally appeared in the first Scent Newsletter (July 2017). To receive all of the articles and features in one place, make sure to subscribe to the Scent newsletter here. In July, our new Scent Newsletter officially launched, with issue #1 providing an in-depth overview of the science behind the Scent project, a summary of the second Scent plenary meeting in Rome, and more. 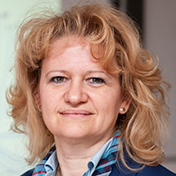 We recently spoke to Ioana Popescu, Associate Professor of Hydroinformatics at IHE Delft.